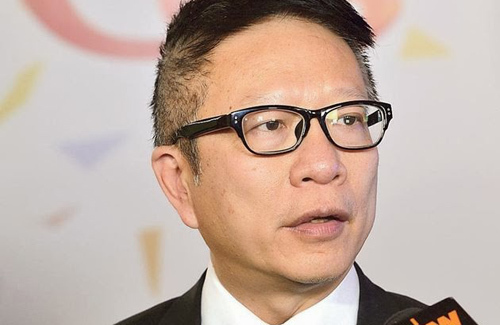 In order to reach wider audiences, HKTV Chairman Ricky Wong (王維基) proposed to use ATV channels to broadcast HKTV programs. If the deal is set, not only will HKTV dramas be able to achieve higher viewership ratings, ATV will also increase revenue. ATV’s final days are nearing, as the cash-stripped station failed to have its broadcasting license renewed for next year. ATV recently held a press conference for its upcoming informative program Fighting Cancer with Love <滅癌獻愛心>, which will feature former TVB actor Kwong Chor Fai (鄺佐輝). Kwong was diagnosed with bowel cancer and has so endured eight chemotherapy sessions. The program, which will begin filming on April 25 and premiere on Mother’s Day, is developed by ATV and various producers. Since last year’s program was a critical success, ATV executive Ip Ka Po (葉家寶) hopes ATV will be able to collect more donations toward its anti-cancer programs. ATV also hopes to be able to broadcast more health programs in the future. Hmmm…this actually wasn’t the best article to translate about the HKTV proposal to ATV, as there is a lot of information missing and it doesn’t give a good picture of the latest on ATV. Also, there have been a few recent developments in the HK television world that might impact ATV’s decision on whether to accept HKTV’s offer (including new buyers for ATV, new players applying for a free-to-air TV license, and also other stations trying to get their hands on ATV’s broadcasting spectrum). Oh and there’s also today’s development about a Mainland investor who bought a controlling stake in TVB (which may impact what ultimately happens to ATV and also who will get their license). The next few months will be very interesting to see how things are going to pan out for all parties involved…. Ip Ka Po also has said that in worst case scenario, May 29 2015 is the last day of ATV if there is no additional funding or new investors. The last deadline was 20 April? HK needs more tv stations to expand in this industry. There are talents and with more platform they can expand the industry. @kangaroo HKTV extended the deadline, since ATV has responded saying that they will discuss with Ricky Wong about the offer. @llwy12 Oh, mind, you/it (the blog, i.e.) seemed very professional. I don’t have time to read now but will come back to read. Korea did a successful job in exporting their culture. The chinese film industry is a large part of HK’s culture and they can do so too, export what they are good at, expand on what they are good at & have been doing for so long and export or retain to attract people to HK, many others. The big boys should not be so protective over their turf. They should be able to lift the industry in HK to greater heights and enjoy the greater pie. Did you guys hear the latest news? HKTV won its judicial review against the government! yes i’ve heard it,great news,but what do you think about the chance that hktv will get a tv licence now? can the Chief Executive in Council ignore the advise of the high court? thats a big question i think. @kolo Unfortunately, this is CY Leung we’re talking about…. since he’s dead-set on not giving HKTV a license, he might still deny them – because technically, the court didn’t say that he HAD to grant a license – they just said that he should “reconsider” (which can be interpreted as “re-evaluate HKTV’s application”)….he can very well come up with a different excuse the next time around. Sure, he will probably incur the wrath of the people, since HKTV has gained a lot of support the past couple months since launching, but quite frankly, I don’t think CY Leung gives a crap – after all, everyone in HK already hates him anyway…. @kolo Here’s the updated article from SCMP. I got a kick out of the part where the court told the government they have to pay HKTV’s legal costs…haha! @llwy12 I’m on the fence with this one, it rings a hollow victory since the law merely states they need to reconsider and aren’t forced to grant one. This might just pass as more ammo for people to use since Hong Kong is embroiled in a bigger issue with universal suffrage. They’re going to need to actually try and spin this one hard now that ATV is closing, not that their first excuse made much sense in the first place. @sodi Agreed…definitely on the same page with you there! To me, all this “victory” does at the moment is throw egg on CY Leung’s face over the lame excuse he gave with the license denial – most likely he will just wipe the egg off and come up with a different lame excuse (and keep coming up with one until his term is over…that is, if he ever leaves…argh). And if it gets challenged in court again, then so be it…..
hmm..you right i aslo think that c.y. leung will come up with another excuse,thats the only thing he is good at,lol. but i still believe in a miracle for hktv,lets hope.